ESOTERIC RECORDINGS are pleased to announce the release of a newly remastered edition of the classic debut album by the acclaimed saxophonist and woodwind player Johnny Almond. “Patent Pending” was the first album by the Johnny Almond Music machine and was issued on Decca’s “Progressive” imprint Deram in 1969. The album was one of the finest Jazz Rock albums of the era, by a band featuring Geoff Condon ( Trumpet, Flugel Horn), Johnny Wiggins (Piano, Organ), Jimmy Crawford (Electric Guitar), Steve Hammond (Guitars), Roger Sutton (Bass) and future Yes member Alan White (Drums). 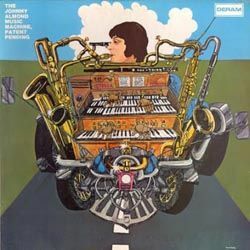 Johnny Almond first came to prominence through his work with John Mayall, Zoot Money, Alan Price and Chicken Shack, before he formed his own group in 1969. A truly original album, “Patent Pending” showcased Almond’s prowess as a composer and outstanding multi-instrumentalist, with him also playing Organ, Mellotron and Vibes in addition to a variety of Woodwind instruments. This Esoteric Recordings reissue has been remastered from the original Deram master tapes and includes a booklet which fully restores the original album artwork and a new essay.